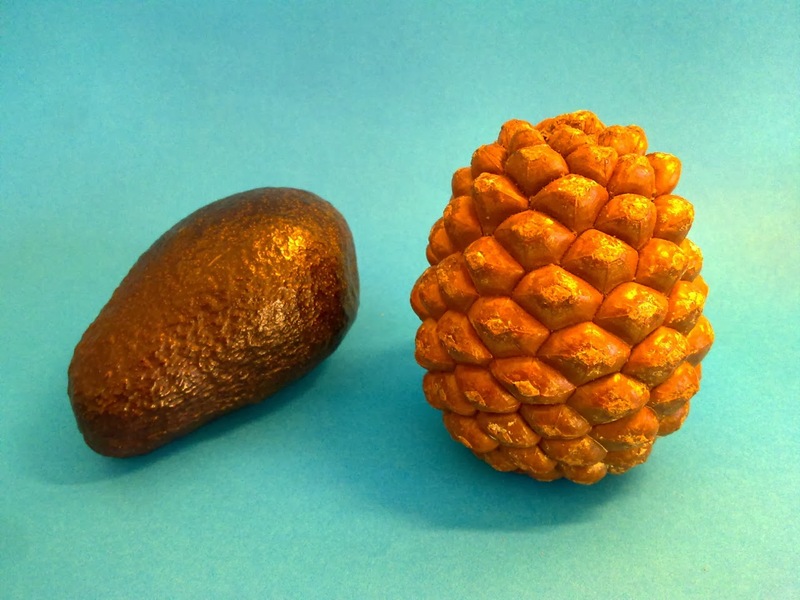 2 Carefully cut in in half without cutting too deep into the seed. 3 Eat the flesh in salad, guacamole or just pure with some salt, pepper and lemon. 4 If necessary, clean the seed. 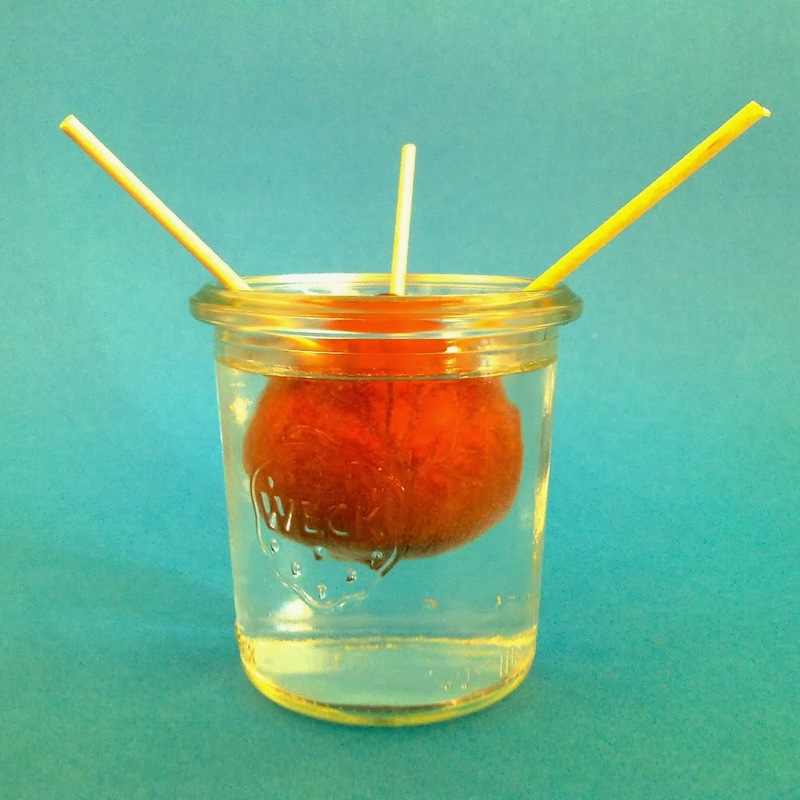 5 Get three toothpicks or similarly thin sticks and prick them into the avocado seed about a third from the top (the pointy part). 6 Get a container like an empty mustard or olive glass with a diameter not much larger than the diameter of the seed. 7 Place the seed inside using the toothpicks to not let it sink in completely. 8 Wait. And refill and change the water from time to time. I had been reading another Bonsai blog yesterday, which suggested to start with ten Bonsai trees, so one wouldn’t focus too much on only one. 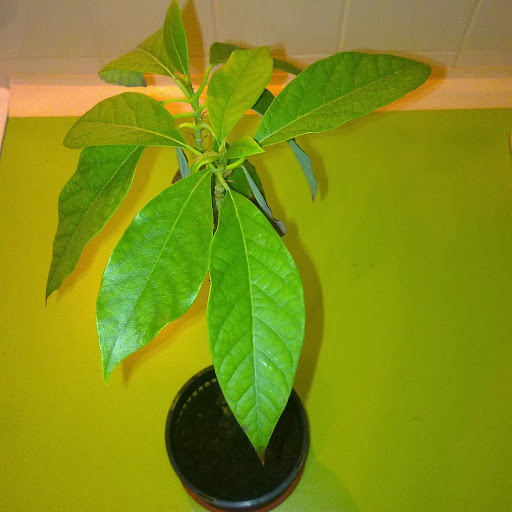 Starting with seeds takes a long time, though, so I decided to convert my Avocado tree into a bonsai. Its trunk is very thin, so I decided to take this on as the first task. Just for the record, it is 6.6 mm at 10 cm above the higher of the cotyledons (there’s this word again, but I had to look it up – again). 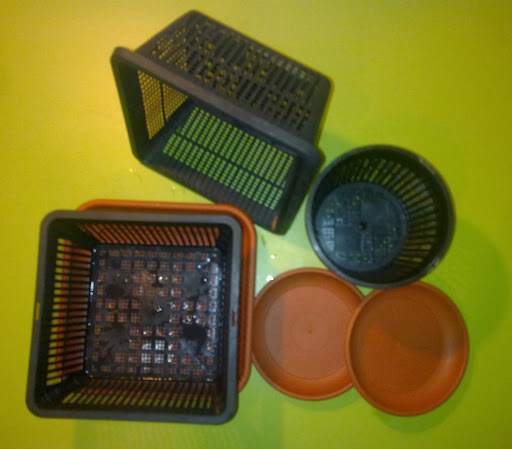 It said in this other blog that one needed net pot planters. Apparently, the roots grow through the holes, but die because of the light. This makes the trunk grow stronger. Well, we’ll see about that. If I haven’t killed it by repotting it, that is. 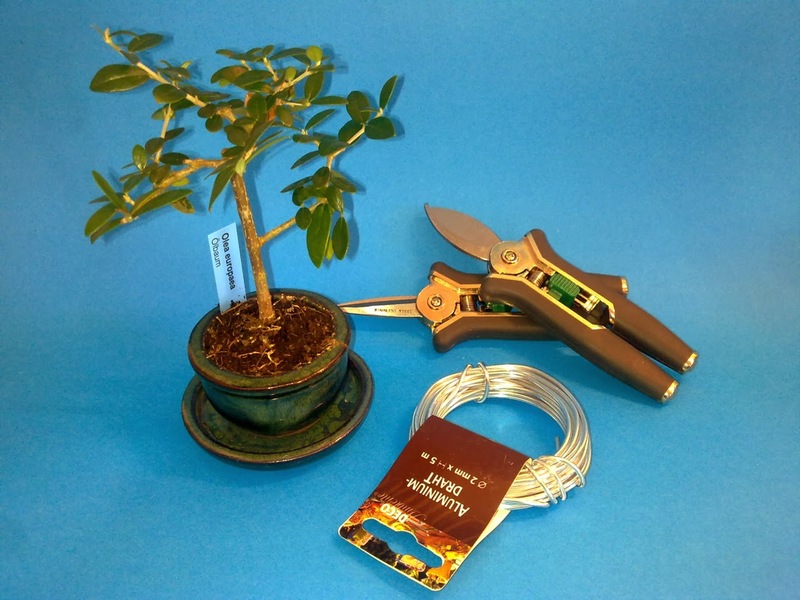 So, after a long work day, I set out to the next DIY store with a gardening department. The weather was quite mild, otherwise I would’ve waited for the weekend to go during daytime. It already started raining when I was inside the store (well, in the outdoor area, so I hoped it was just a kind of irrigation system). But it DID rain alright. I was soaked when I got home. Anyway, I got four net pot planters with matching (sizewise, not colorwise) saucers. 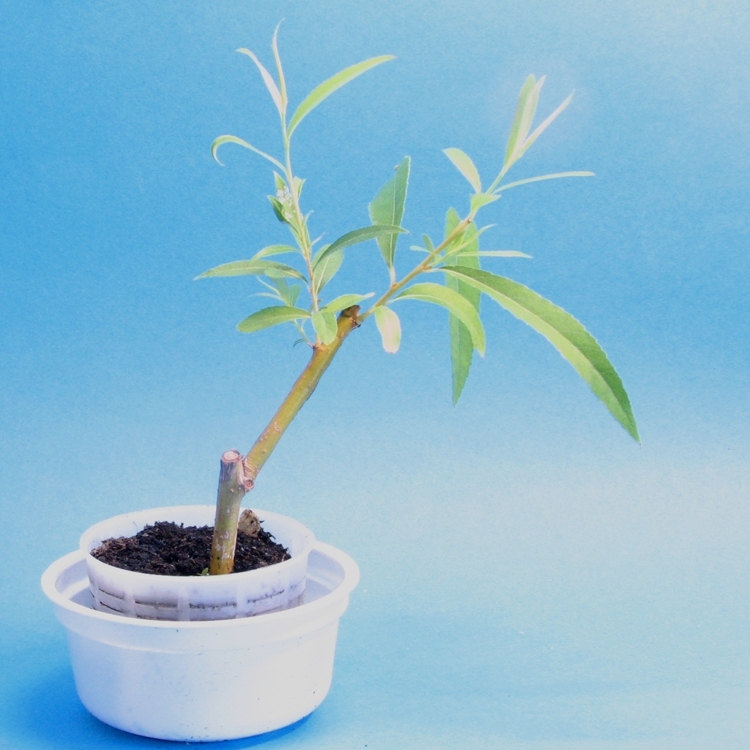 The I took the avocado tree from its pot, cleaned the soil off a bit with a chopstick (which was suggested in some other blog and which I find rather suitable for Bonsai) and cut some roots off. 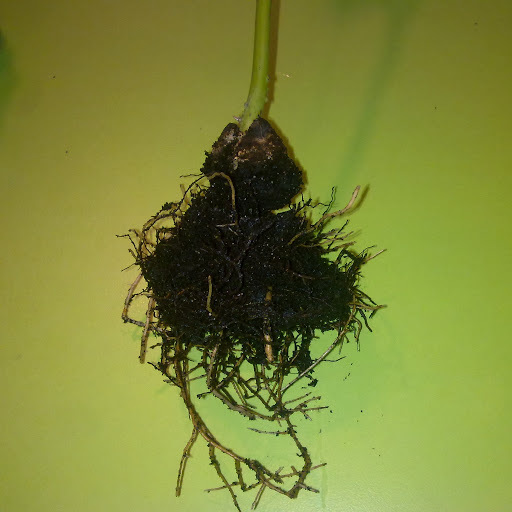 It said to cut off roots that grow downwards. I was a bit shy about the root cutting, because I was afraid to kill the tree, which has grown dear to me and which has moved houses three times already with me despite its young age. Note that I left some of the old soil. 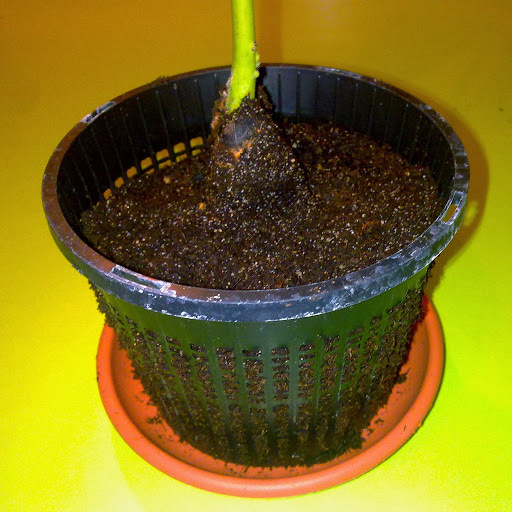 Then I put some of the soil that came with the Bonsai starter kit into one of the round net pot planters, put the avocado tree in, added some of that soil and some of some special herbs soil I had bought some years ago, because it doesn’t contain any fertilizer. Then I took the pictures, watered it, and put it back into the window sill. Fingers crossed that it will survive this treatment. I don’t think I have ever repotted any plant of mine. I think the avocado came from Israel, by the way, so this is a proper mediterranean tree.